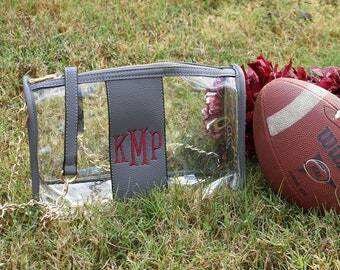 Get Game Day ready with the Monogrammed Clear Stadium Purse. 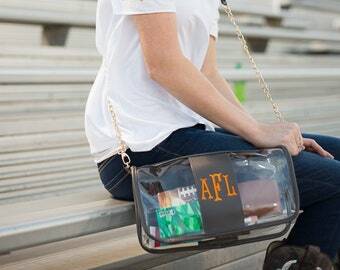 After the tailgate is over, security will be a breeze with this stadium bag. 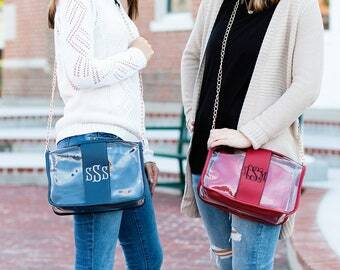 The clear crossbody purse will securely be by your side the entire game, and leaves you hands free to cheer on your favorite team! 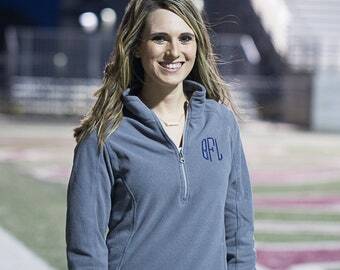 Coordinate to any fan gear by choosing your monogram color to match your team. 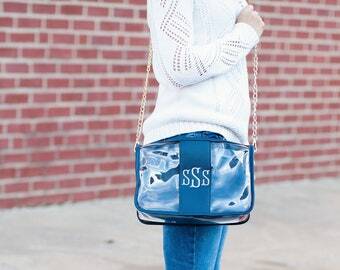 This bag features a bag-in-a-bag style that can also be monogrammed. 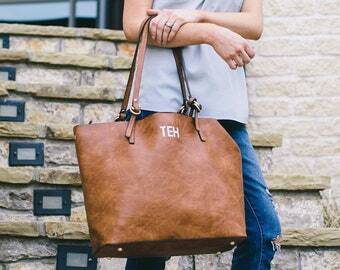 The interior bag is great for money and personal products. 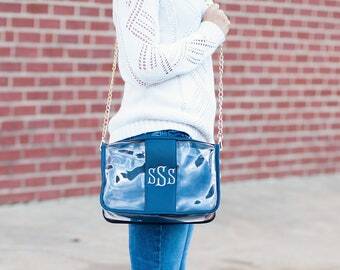 This bag can be removed when not needed if you are wanting a completely clear purse; the interior can be added for privacy or used with the strap when clear bag not needed. **This feature may require additional search at clear bag policy events. Please check the policy for the event you are attending. Hurry, the kick-off won't wait! 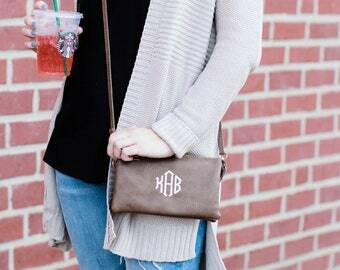 - The price you see includes a monogram or one name. Excellent! 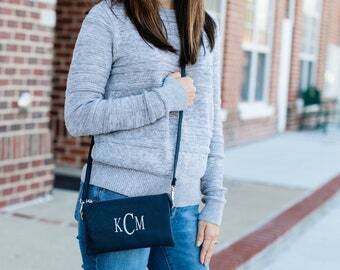 My daughter loved the purse and insert bag! 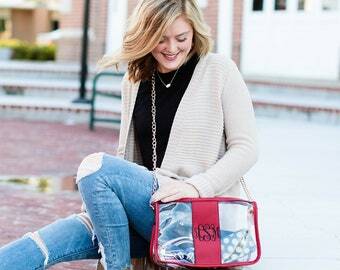 The best clear handbag for size and quality we have found. We accept PayPal, credit cards through Etsy's Direct Checkout Option, and Etsy gift cards. Payment must be completed before your order will be started. Orders not paid within 3 days will be canceled. Cancellations are accepted with 24 hours of order. 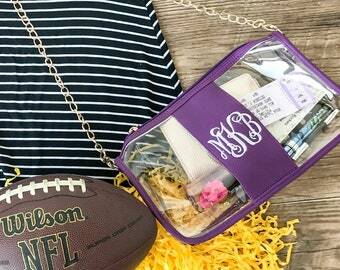 Because all of our items are personalized, we do not accept any returns or exchanges. Please double check sizing and that you put letters in the correct format. Instructions are located in the photos and description of each listing. If you need help determining your size, we'd be happy to send over a size chart and discuss how the fit was for us prior to ordering. If you believe you have received an item that has an error or is damaged, please contact us with 3 days of receiving your package, and we will work together to get the problem fixed. If you made an error on your order, (letter order, size, etc. we offer to re-do the item at a discounted rate of 20% off). If your item becomes defective within 60 days, please contact us with pictures, and we will look at each order on a case by case basis. We do not guarantee products beyond 60 days. We primarily use USPS First Class and Priority mailing. Large orders may be shipped through UPS or Fed-Ex. In all cases, a tracking number will be sent to you as soon as your item ships. We do not require a signature to receive packages unless requested. At this time we do not ship internationally. Please make sure to include all needed information for embroidery in the Notes to Seller box upon checkout. The needed information is listed in the description and photos of each item. We will make several attempts to contact you for missing information through Etsy and e-mail. If there is no response within 3 days, we reserve the right to cancel order or to choose things such as thread color and font ourselves. Colors may vary slightly due to differences in lighting and computer/phone screens. 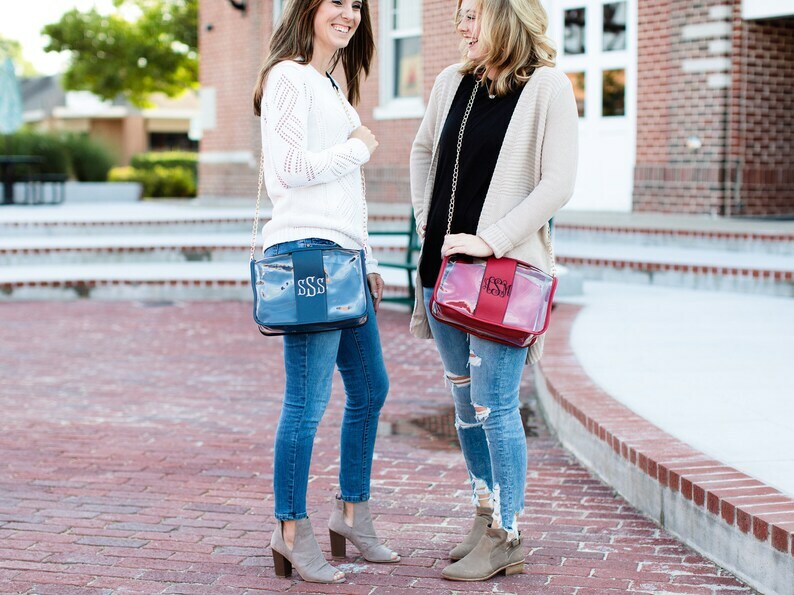 Please let us know if you have any questions about the color of a product or thread combination before you order, as we do not accept returns or exchanges based on color. Our first and main communication will be through Etsy messaging for Etsy orders. We strongly suggest that you turn on e-mail message notifications for your Etsy account. We will follow up with one e-mail to the e-mail address listed on your account.